Hundreds of people gathered Thursday night to honor the six officers injured and mourn the loss of 52-year-old Sgt. Terrence Carraway who was killed as they tried to serve a search warrant. The suspect, 74-year-old Fred Hopkins, is in custody. He is a Vietnam veteran and disbarred attorney. “He [Carraway] had a badge, yes…but he had another badge. It was a badge of love,” said Rev. Dr. Cecil Bromwell, who was Carraway’s pastor at Macedonia Baptist Church. 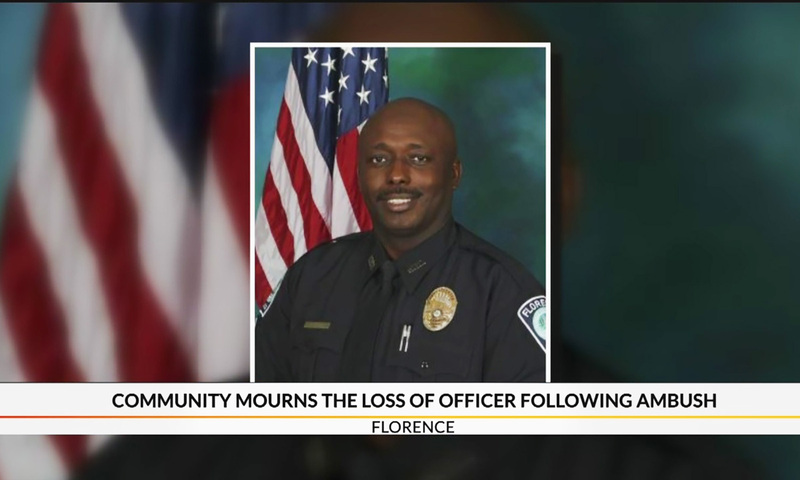 Carraway had served the Florence Police Department for nearly 31 years. “He was always involved with young people. Camp Fever…program [which] took young kids in a Summer program…basketball leagues…just very involved with the community,” said Florence resident Jerry Keith Jr.
At the vigil, a blue candle burned in Carraway’s honor. His police car sat outside the church. He was one of four officers and three deputies injured in a two hour long standoff at a home at the Vintage Place subdivision Wednesday. The violence began when deputies went to serve a search warrant involving a 27-year-old at the home accused of sexually assaulting a foster child. The suspect in the shooting has not been charged. Thursday afternoon, Florence Police Chief Allen Heidler said two officers are out of the hospital. A third officer is in serious but stable condition. He said he did not know the status of the three deputies injured.